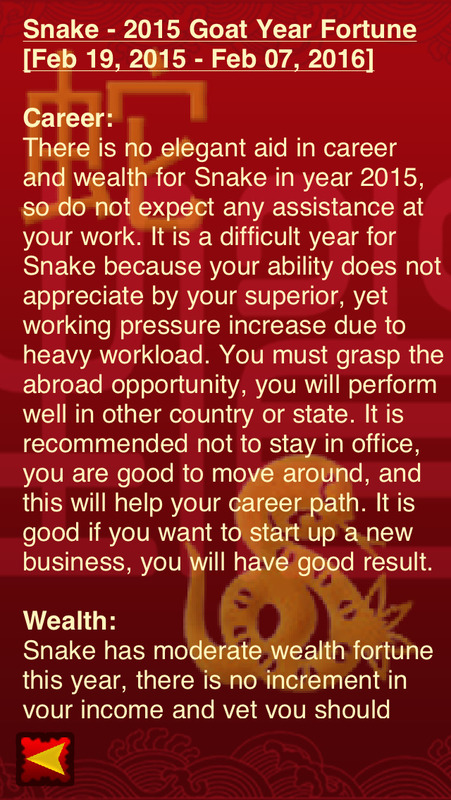 Do you know your fortune of year 2015? Do you know what is your ideal job? Do you know who is your best lover? Do you know what is your lucky number? Do you know what is your lucky flower? The Chinese Zodiac is the most ancient system of customs and beliefs that existed many centuries ago in China. The Chinese Zodiac is a 12 year cycle. Each year of the 12 year cycle is named after one of the original 12 animals. Each animal has a different personality and different characteristics. The animal is believed to be the main factor in each person's life that gives them their traits, success, and happiness in their lifetime. Chinese Zodiac application supports retina display (high resolution), iPhone 6, iPhone 6 Plus and iPad Air 2, iPad Mini 3. This application aims to help people to term with their good and bad traits and rectify the negative qualities if they have any, so to lead happy and prosperous life. Please visit our support site if you have any question, suggestion or feedback. - Updated support to iOS 8 - 64bits. - Added 2015 daily fortune. - Added 2015 year and month fortunes. - Full screen to any resolution especially iPhone 6, iPhone 6 Plus, iPad Air 2, iPad Mini 3. - Fixed Horse 2014 year fortune errata. - Fixed In App purchase of 2014 month fortune.